Malaria is one of the most important infectious diseases of humans and the most important parasitic disease. As the cause of both direct and indirect morbidity and mortality, it represents an enormous physical, psychic and also socioeconomic burden for the populations and states that it affects. Malaria is caused by four Plasmodium species, namely P. falciparum. P. vivax, P. ovale and P. malariae. Severe morbidity and high mortality is almost exclusively seen in P. falciparum infections. Malaria parasites have an indirect, complicated life cycle with many different life stages. The parasite's definitive hosts are mosquitoes of the genus Anopheles from the family Culicidae. In humans, the parasite multiplies asexually in the liver (exoerythrocytic schizogony) and in red blood cells (erythrocytic schizogony). The merozoites (in the case of P. falciparum, there can be several in one host cell) turn into young trophozoites, the so-called ring stage. Further development and growth result in schizonts with 8–32 nuclei. The red blood cells burst, triggering a fever response; the incubation period following the initial infection is at least 9 days, usually 12–14 days, rarely longer. The merozoites emerging from burst cells can reinfect new erythrocytes. With tropical malaria (in contrast to other human-pathogenic Plasmodium spp. 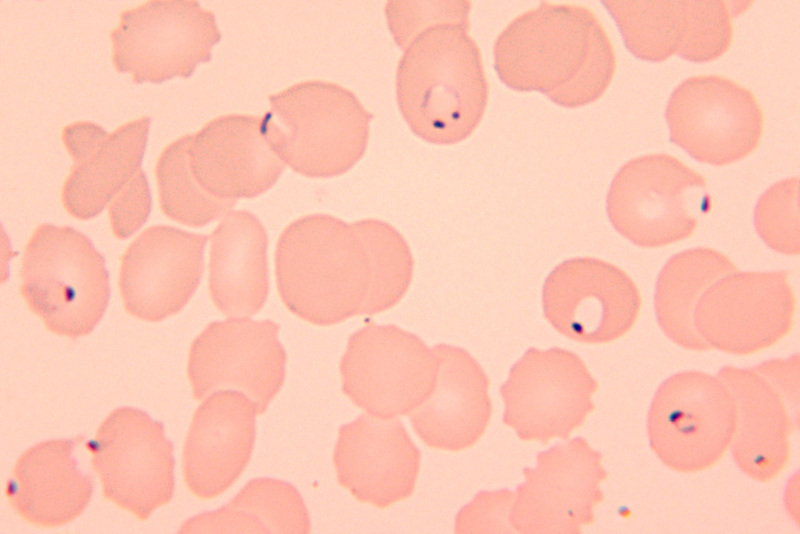 ), only erythrocytes with young trophozoites and late gametocytes can be found in the peripheral blood. All host cells containing other stages are sequestered (bound to the endothelial cells of the blood capillaries) and thus escape destruction in the spleen. The first micro- and macrogametocytes – which are infective for the definitive host, the anopheline mosquito – are produced only after many weeks of erythrocytic schizogeny. Once the sexually differentiated gametocytes have been taken up by the vector, they change into gametes in the mosquito's gut. Following the fertilisation of the macrogamete, the elongated ookinete develops from the zygote. The ookinetes leave the gut lumen and penetrate the midgut epithelium. Large oocysts develop on the outer surface of the gut wall, each containing up to 10,000 sporozoites. When the oocysts burst, the sporozoites enter the mosquito's haemolymph, and ultimately reach the salivary glands. A mosquito whose salivary gland ducts contain sporozoites can infect a human. At least 8 days will lapse before a mosquito that has become infected can itself transmit the infection.